2012 Watch Your Mouth Faceoff! 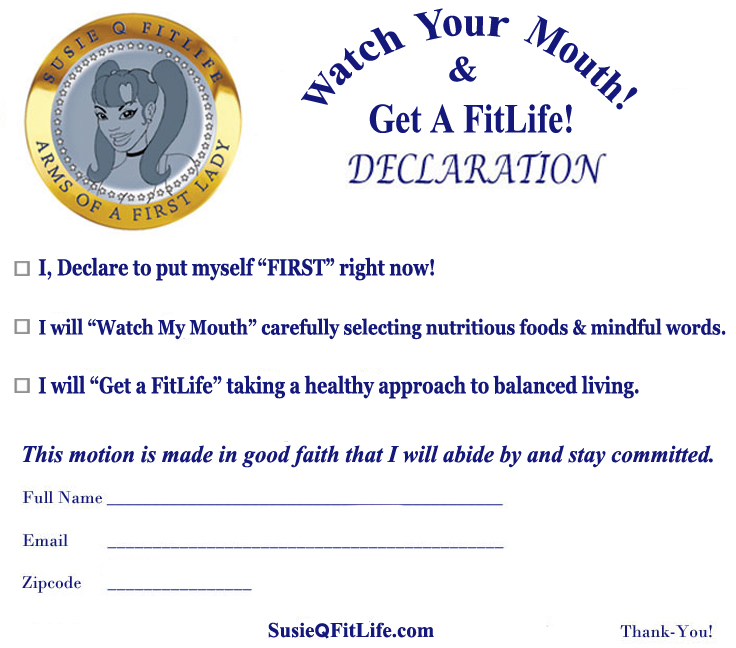 Watch Your Mouth & Get a FitLife Campaign Kicks Off in High Gear for 2012! It’s not about how you spent your New Year’s Eve night; it’s about what you do from midnight & beyond that counts! Get ready to make some changes in your FitLife with the “Watch Your Mouth Faceoff!” 2012 mission! Celebrity Fitness Trainer SusieQ is ready to participate with anyone getting involved, from students to seniors! This experience will unite the FitLife family to reduce bad habits in exchange for healthful habits online for FREE! Just how long does it take to break a bad habit? Is it 21 days? 60days? Six months? We are all creatures of habit; however, we are all unique with different behaviors & learning curves. You can now put yourself to the test & you will be held accountable! Here are a few examples listed below to give you an idea about how the faceoff will work! Creating positive changes in your FitLife! A student can decide to cut back on eating junk food & hours of TV viewing to get involved with playing sports! A stay at home mom may experience emotional eating and may want need guidance in selecting “Watch Your Mouth Habits” to gain control! A male addicted smoker may desperately want to change his ways & possibly engage in jogging to jump start his heart & lungs in the right direction. A senior may battle depression leading to inactivity, but would love to escape & network with FitLifers to Get a FitLife! How to get involved with the Watch Your Mouth Faceoff! Step 3: Connect with us via Facebook & Twitter to begin posting your habits with the FitLife family! Step 4: Upload a 1-minute (maximum) Youtube video entitled “Watch Your Mouth Faceoff 2012” to publish the habit you are going replace! You must end your video by stating the tagline: “Watch Your Mouth & Get a FitLife!” This will hold you accountable as SusieQ & the FitLife family will be watching you too! 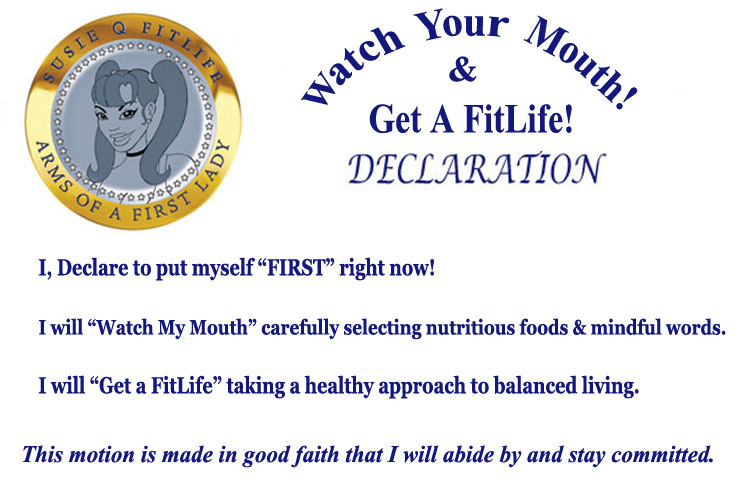 The “Watch Your Mouth Faceoff!” will accredit your FitLife Declaration! Performing different actions, produces new results; allowing you to make some major changes from improving healthful eating habits to increasing your physical energy level. SusieQ FitLife will begin to post Fitness Goals & Workouts to keep you motivated and inspired to stay on track! Watch Your Mouth Foods will soon become implemented on the site giving you great choices whether you may be Vegan or a full-fledged Meat lover. There will be options for everyone! Most importantly, when you Watch Your Mouth & talk back to SusieQ or the FitLife Family we are always listening and welcome your words!